단속사 터의 금당터 앞에는 동서로 두 탑이 서 있는데 그 중 서쪽에 세워진 것이 이 탑이다. 2단의 기단(基壇)에 3층의 탑신(塔身)을 올린 통일신라시대의 전형적인 모습이나, 동탑에 비하여 많이 부서지고 안에 봉안된 사리함이 도난당하는 등 많은 수난을 겪었다. 기단에는 각 면의 모서리에 기둥 모양의 조각을 두었는데, 아랫단은 가운데에 2개씩을 두고 윗단은 1개씩 두었다. 탑신의 지붕돌은 처마를 직선으로 처리하였으며, 밋밋한 경사가 흐르는 윗면은 네 귀퉁이에서 하늘을 향해 살짝 들어 올렸다. 지붕돌을 경쾌하게 처리한 점이나, 탑의 윗부분으로 갈수록 크기가 알맞게 줄어드는 수법에서 통일신라 석탑의 전형을 계승하고 있는 것을 볼 수 있다. 아랫기단의 너비가 넓어지고 4면에 새긴 가운데기둥의 수가 아랫기단은 2개, 윗기단은 1개로 줄어든 점으로 보아 통일신라 후기의 수법을 잘 보여주는 작품이라 하겠다. 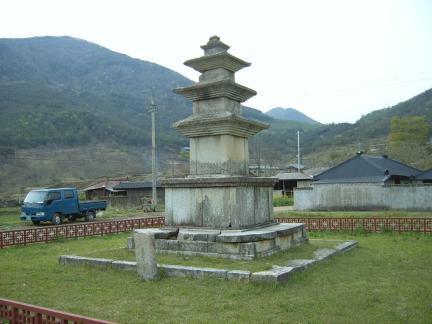 This typical example of a Unified Silla stone pagoda, consisting of a three-story main body erected on a two-tier stylobate, is situated in front of the former site of the Geumdang Hall of Dansoksa Temple, along with the east pagoda. 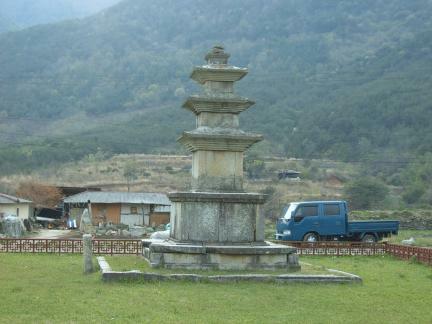 The west pagoda is more damaged than the east one, and its sarira reliquary was stolen by thieves. The two-tiered stylobate has pillar patterns on every corner; the center of the lower tier is also carved with two pillar patterns; and the upper tier has one pillar pattern. The roof stones have horizontal eaves that curve gently and then turn sharply upwards at the corners. The expression of the roof stone and the upwardly-tapering body follow the techniques used to build most Unified Silla stone pagodas. 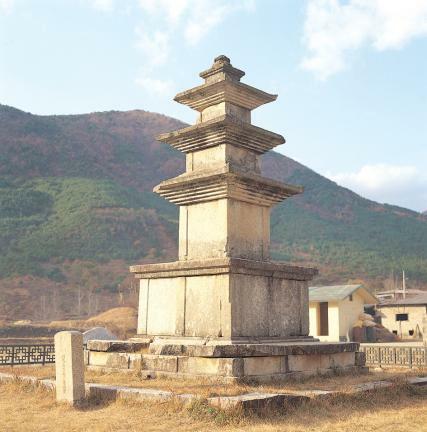 The large lower stylobate, and the variation in the number of carved pillar patterns, falling from four on the lower tier to three on the upper tier, are typical features of late Unified Silla pagodas.